January was a good month for Korea, with a spectacular winning streak by a Korean player in one international team tournament and yet another victory in another. Despite many recent individual successes by Chinese players, Korea still seems to be the country to beat. Korea's top batter, the 19-year-old Mun To-weon 2-dan, has made an extraordinary start, winning all seven games in the opening round of the 9th Cheongkwanjang Cup. She set a new record for this tournament. This round was played in Hangzhou, China. The second round will be played in late March. Japan has just one player left and China two. Can they stop Mun from making a clean sweep? (W)beat Aoki Kikuyo 8-dan (Japan) by resignation. Game 2 (9 Jan.). Mun (W) beat Lu Jia 2-dan (China) by 18.5 points. Game 3 (10 Jan.). Mun (W) beat Chinen Kaori 4-dan by 10.5 points. Game 4 (11 Jan.). Mun (W) beat Li He 3-dan (China) by 7.5 points. Game 5 (12 Jan.). Mun (B) beat Mukai Chiaki 4-dan (Japan) by 1.5 points. Game 6 (13 Jan.). Mun (B) beat Song Ronghui 5-dan (China) by resignation. Game 7 (14 Jan.). Mun (W) beat Suzuki Ayumi 5-dan (Japan) by 3.5 points. Korea scored its tenth victory and third in a row in the Nong Shim Spicy Noodles Cup when Ch'oe Ch'eol-han mopped up the resistance in the final round. Ch'oe earned a bonus for a winning streak of four games, and the services of Korea's ‘iron goalkeeper', Yi Ch'ang-ho, were not called on. (W) beat Zhou Ruiyang 5-dan by resignation. Game 12 (19 Jan.). Ch'oe (B) beat Yuki Satoshi 9-dan (Japan) by resignation. Game 13 (21 Jan.). Ch'oe (W) beat Kong Jie 9-dan (China) by resignation. 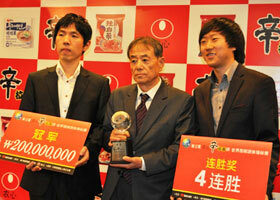 The opening round of the 3rd BC Card Cup was held in Seoul on 29 January. Japan had only two representatives in this tournament, and they were both eliminated in the first round. Cho Chikun 9-dan (B) lost by resignation to Yan Huan, a 19-year-old 5-dan from China, and Sakai Hideyuki 8-dan (B) lost on time to Korean veteran Yu Ch'ang-hyeok. It can really be claimed that this title match will decide the number one player in Japan, as the holder of the number two title, Iyama Yuta Meijin, is challenging the holder of the top title, Cho U Kisei. This is the fourth time that the Meijin has challenged the Kisei (so far the Meijin challenger has won twice). Cho and Iyama have fought two best-of-sevens so far, with the score being 1-1, so in that sense also this series will decide who is the number one -- for the time being, of course, as we can expect their rivalry to continue for a decade. In personal encounters to date, Cho holds a 14-11 lead, but in the 11 games played in the last two years Iyama has the lead, 7-4. However, after losing six games in a row to Iyama, starting with the second game of the 2009 Meijin title match, Cho has recovered and won their last two games. According to Ishida Yoshio 9-dan, if anything, there will be more pressure on Cho U. He will be defending his title and, at 31 (on 20 January), he is ten years older than the challenger. Moreover, he lost the most recent best-of-seven between the two, when Iyama took the Meijin title from him in 2009. 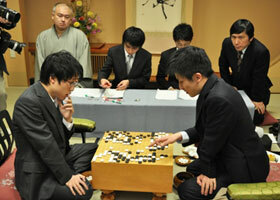 The first game was played at the Konjakutei inn in Aizu Wakamatsu City, Fukushima Prefecture, on 13 & 14 January. Fighting started early and continued throughout. Taking black, Iyama played well in rescuing a group that came under severe attack. After the middle game, Iyama seemed to have a slight lead. Cho suffered a hallucination and resigned after 207 moves, but the game was already a safe win for Iyama. The second game was played at the Number Two Meisuitei inn in Date City, Hokkaido on 26 and 27 January. Taking black, Cho won by resignation after 189 moves. The game started with Cho developing rapidly and Iyama playing solidly. Iyama succeeded in laying waste to Cho's moyo on the right side of the board and he built up a lead. Later, Iyama started a large ko in the top left in an attempt to wrap up the game, but this turned out to be overdoing things and gave Cho a chance to get back into the game. In the large trade that finished off the ko fight, Cho staged an upset. The third game will be played in Himi City in Toyama Prefecture on 2 and 3 February. 1st 13, 14 Jan. Fukushima Iyama (B) won by resig. 2nd 26, 27 Jan. Hokkaido Cho (B) won by resig. Xie Yimin has made a good start in defending the first title in her triple crown. This year Umezawa Yukari 5-dan is challenging for the 14th DoCoMo Cup Women's Kisei title in an attempt to regain the title she lost to Xie last year. The first game was held at the Hotel Sunlife Garden in Hiratsuka City, Kanagawa Prefecture, on 27 January. Taking white, Xie won by 9.5 points. The second game will be played on 16 February. 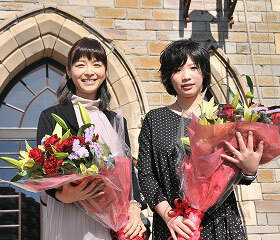 The final round of the 23rd Women's Meijin League was held on 20 January. Mukai Chiaki 4-dan lost her last game but still won the league because her only remaining rival, Okuda Aya 2-dan, also lost. Four players ended up on 4-2, but there is no play-off in this league; Mukai took the honours thanks to having the highest ranking. Incidentally, only these four players retained their places, which makes it a pretty tough league; Mannami Nao 2-dan improved her score to 3-3 by winning her final game but was still eliminated from the league. The title match with Xie Yimin will start in March. Mannami Nao 2-dan (B) beat Mukai Chiaki 4-dan by half a point. Yoshida Mika 8-dan (W) beat Okuda Aya 2-dan by resignation. Suzuki Ayumi 5-dan (B) beat Umezawa Yukari 5-dan by resignation. In the final of the Losers' Section of the 49th Judan tournament, held on 20 January, Takao Shinji 9-dan (W) beat Ko Iso 7-dan by resignation. Takao will meet his nemesis, Iyama Yuta Meijin, in a play-off to decide the challenger to Cho U.
Hane Naoki has not played any games in the league since our last report, but he remains in the sole lead. In sole second place is league newcomer, Seto Taiki 7-dan, the only player with just one loss. Hane's next two games look like playing significant roles. In February, he will play Cho U and then in March there will be face-off with Seto. (6 January) O Rissei 9-dan (B) beat Takao Shinji 9-dan by resignation. (20 January) Cho U Kisei (B) beat Cho Sonjin 9-dan by resignation. Seto Taiki 7-dan (B) beat Kobayashi Satoru 9-dan by 3.5 points. Yamashita Keigo and Yuki Satoshi are already the only undefeated players in the current Meijin League and they share the lead on 2-0. (6 January) Cho U Kisei (B) beat Hane Naoki 9-dan by resignation. Rin Kanketsu 7-dan (W) beat Mizokami Tomochika 8-dan by half a point. (13 January) Yuki Satoshi Tengen (W) beat 25th Honinbo Chikun by resignation. (20 January) Yamashita Keigo Honinbo (B) beat Sakai Hideyuki Gosei by resignation. (27 January) Yuki Satoshi Tengen (W) beat Takao Shinji 9-dan by half a point. To 4-dan: Ms. Komatsu Hideko (50 wins). Cho U topped this list for the fourth year in a row. He may not have won as many titles as the year before, but one of the ones he did win was the Kisei, which is worth 45 million yen. He also defended the Judan and Oza titles and scored competitive results in nearly every tournament. This year Yamashita Keigo gave him a close run. Although he lost the Kisei title to Cho, he replaced it with the Honinbo title, which earned him 32 million yen, and played in the Judan and Tengen title matches; he also did well in fast-go titles, winning the Ryusei tournament and the Agon Kiriyama Cup. Xie Yimin, the top woman player, made the top ten for the third year in a row. Michael Redmond has made a good start to the year with two wins in January. (50th Judan tournament, Preliminary A). (Preliminary A, 67th Honinbo tournament). I hope that you have enjoyed this news service. It began in June 1998 and has continued, sometimes intermittently, for over 13 years, but I have been informed that this is the last instalment. I would like to thank you for your patronage over the years and wish you the best of luck in your go activities.